Imprinted Area: 3"x3". Screen printed, pad print, laser engraved. Decoration not included in price. 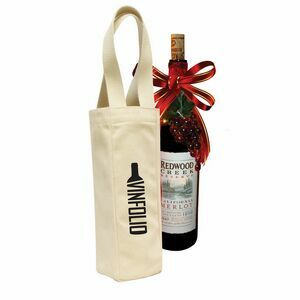 Wine carrier or storage bag for 1 bottle. 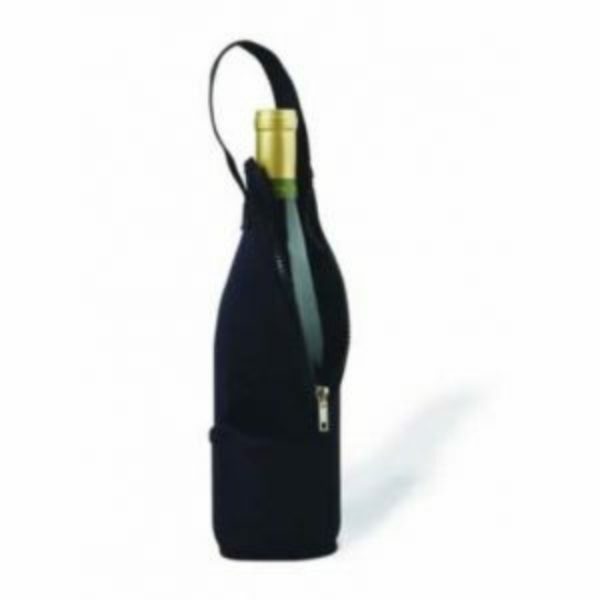 Our black leatherette single bottle capacity wine bag is one of our most popular high end items, particularly among women. 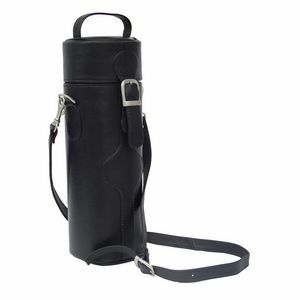 It is an absolutely stunning bag made from black leather that gives it a sophisticated, professional look. At the same time, its slightly triangular shape gives it a more feminine allure, which is precisely what attracts many women to it. This bag is almost exclusively used for gift giving, either as a corporate gift, or as a gift to a significant other. 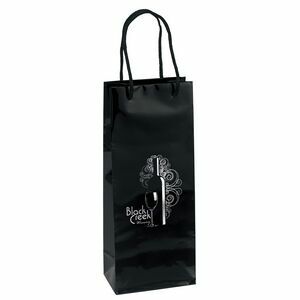 Your customers will really appreciate this bag, particularly if you stock more expensive and exclusive bottles of wine. 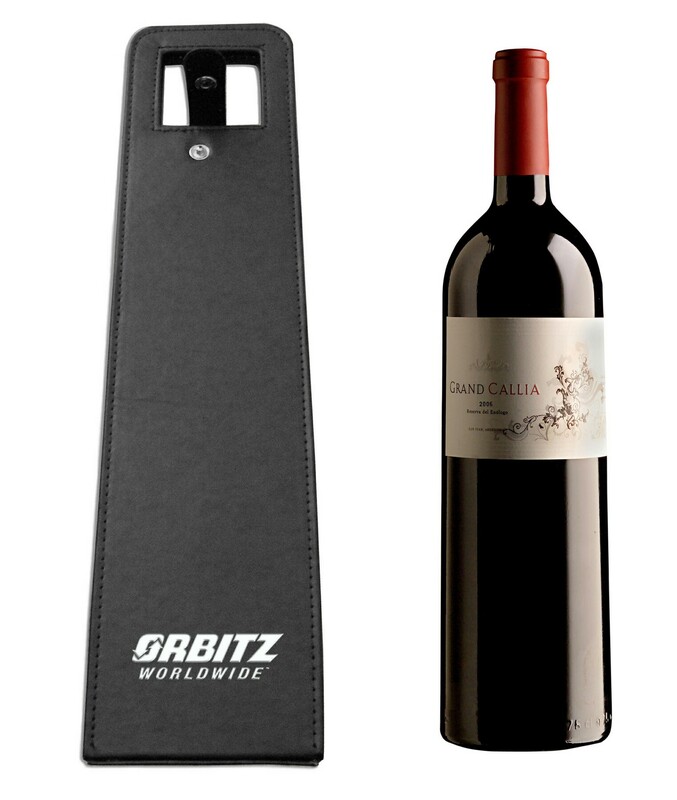 While it is never acceptable to send your customers on their way while bagging or even double bagging their purchases in a paper or plastic bag, it is even less acceptable for a truly high end bottle of wine. As such, they will appreciate your thoughtfulness and understanding of their needs. 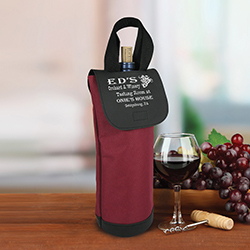 The bag is designed to be strong and durable and will hence not only hold the bottle safely when your clients leave your store, but it can be used again and again as well. 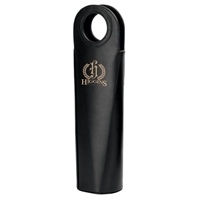 Furthermore, the bag can be screen printed, pad printed or laser engraved with your store's name and logo. In so doing, you turn a fantastic bag into an even greater marketing tool. The very instant your customer leaves your store, they will start to advertise you as well. This will make sure that your brand becomes more established. The fact that your customers will truly appreciate the bag itself and that they will therefore increase their loyalty to your store is an added benefit. This bag is quite unique and we are currently one of the only online stores to have it in stock. As such, we encourage you to visit our website to request your free, no obligation quotation.